At some point in your work you may run into a need to globally assign a specific file type to open using a specific program. I recently was tasked with completing this objective. In my case it was setting the TSV file association to open with Excel. Below are the steps to follow if you need to do a similar file extension modification using GPP. I had originally been hesitant to use GPP's because I thought they required a 2008 domain controller. This is not the case. These GPP's can be easily used assuming you meet the prerequesites below. 1. 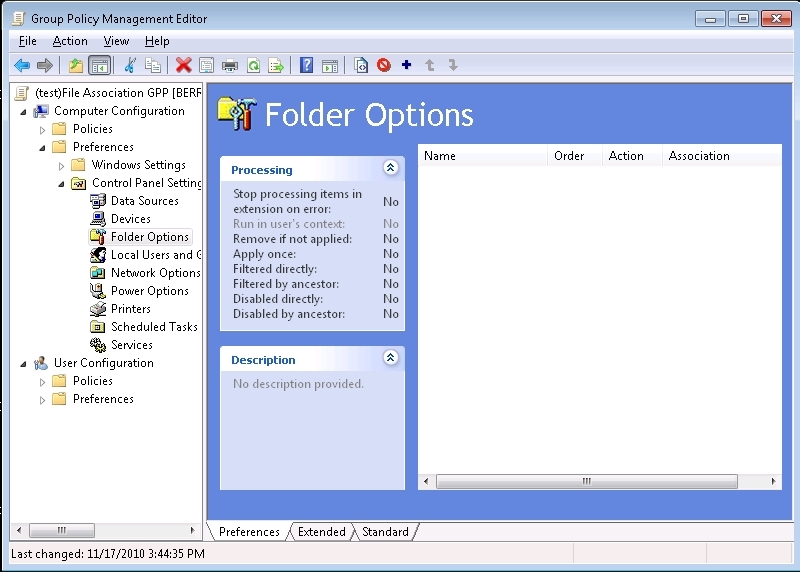 You will need to create the GPP on a Vista, 7, or Server 2008 machine with the Group policy management console available. 2. 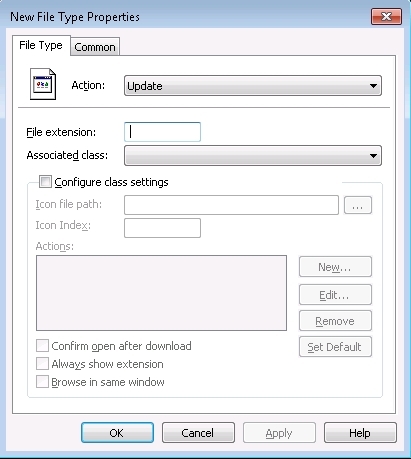 Your clients will need to have the group policy preferences client side entensions installed on them. These come installed by default on Vista and 7. For XP you will need to download them here. This update can also be pushed to your clients via WSUS. I did not have to do install this for the GPP to work on my XP machine. nce you have the 3 pre-requesites above covered simply open up the GPMC. 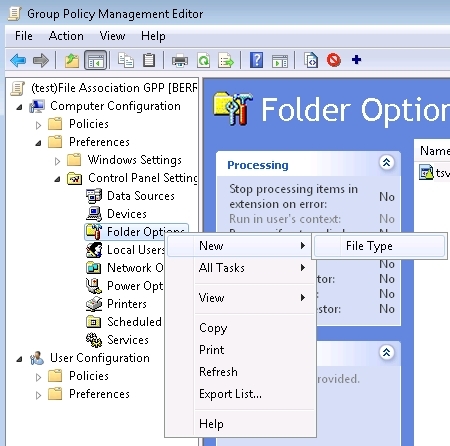 Right click the group policy object container and select new or open an existing group policy. 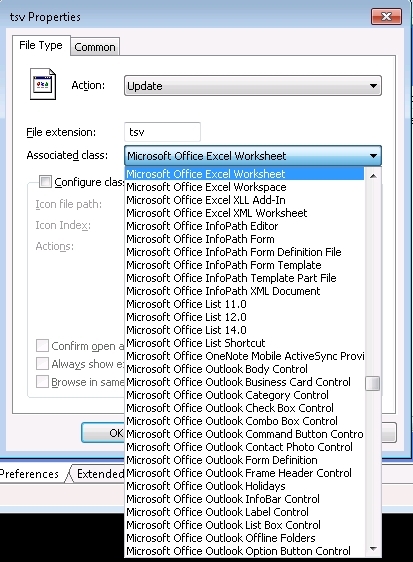 Right click on folder options and select new, file type. 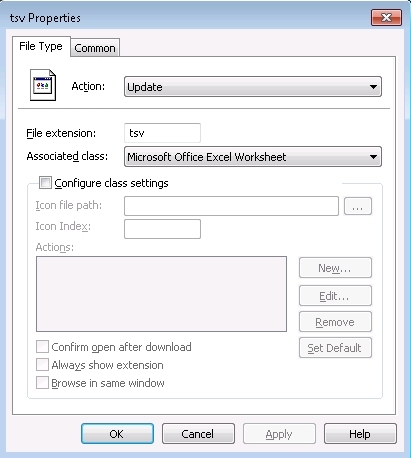 The new file type properties window will appear. The first option you have to configure is the action you would like to perform. The dropdown has 4 choices Create, Replace, Update, and Delete. For an explanation of each hit F1 and you will be presented with descriptions. In this case I chose to update the extension. 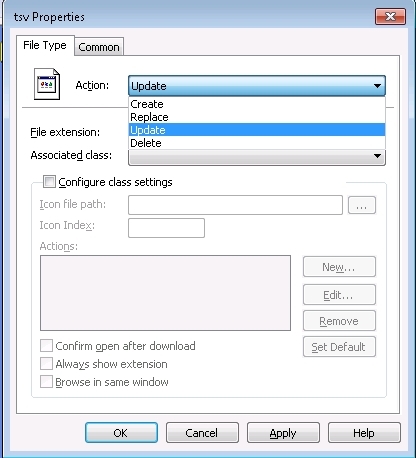 Next enter your file extension without the dot in front (tsv not .tsv) and select the associated class from the dropdown. In this case I am using Excel to open my TSV files. One important item to note is that the program whose associated class you choose must be installed on the machine where you are creating the GPP. If it is not installed you will receive a "Could not save settings file error 80070003"
Once you have the settings entered hit apply to save the GPP. At this point you can close out to the main GPMC window and apply your newly created GPP to your target OU. Since this is a computer policy you will need to perform a reboot for it to apply. Upon reboot your new file associations should be active.